Company Name: Geo Power System Co., Ltd. The Geo Power System is an innovative heating, ventilation, and air-conditioning (HVAC) system that uses the earth’s nearly constant underground temperature to passively warm or cool air for residential, commercial, or agricultural uses. The core of the system is a unique double pipe earth-to-air ground heat exchanger that is installed vertically in the ground to a depth of about 16 feet. 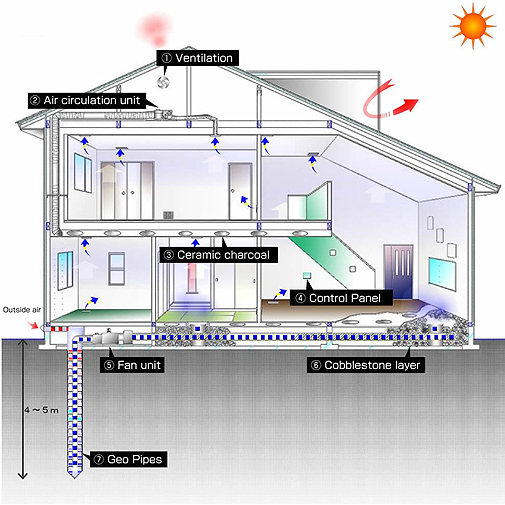 In most applications the system includes a cobblestone layer in the building foundation for further temperature control. The Geo Power System’s simple design and components make for easy installation and maintenance as well as low operating costs. The system can benefit all low story buildings, whether new construction or remodeling. Hot and humid air from outside is drawn through the Geo Pipes, which transfer the heat to the ground. The cooler air is then blown into the house through the floor vents. Besides supplying cool air, the system naturally reduces humidity and purifies the air. In the summer, the layer of cobblestones in the foundation holds on to the coolness, making the best use of natural resources. A fan in the attic automatically ventilates hot air that rises inside. At night, it brings cool air into the house when the temperature outside drops below a predetermined point. A fan in the attic automatically ventilates hot air when the temperature reaches a predetermined point. Air below a certain temperature is sent back to the Geo Pipes. Ceramic charcoal placed in the floor and attic naturally reduces odors, helps control humidity, and emits far infrared rays, which may be beneficial for health. The energy-saving design includes a brushless DC motor for energy efficiency during the 24-hour programmed circulation. The cobblestone layer stores natural coolness and helps keep indoor temperatures from rising during the summertime. The Geo Pipes transfer heat from the hot outside air to the ground. Moisture in the air condenses out, controlling humidity and removing pollutants. Cold air from outside is drawn through the Geo Pipes, which transfer heat from the ground to the air. Warmer air is then blown into the house through the floor vents. In the winter, the layer of cobblestones in the foundation acts as a heat storage chamber, providing a radiant heating effect, and making the best use of natural resources. Heat generated indoors from lighting, appliances, and the human body is not wasted. Warm air that accumulates in the attic is sent back through the Geo Pipes. Warm air that acumen rates in the attic is reused. Solar bless: The solar bless captures energy from the sun, providing one more way of utilizing valuable natural resources. The cobblestone layer stores heat, which radiates indoors, thereby helping to moderate the temperature further. 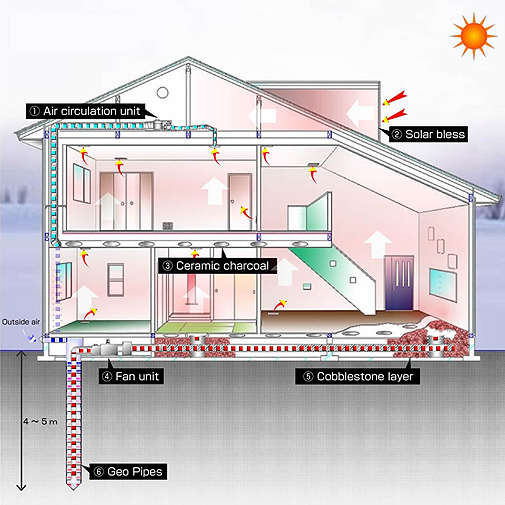 The Geo Pipes transfer heat from the ground to the cold outside air before it goes into the building. Water directed into to the pipe during maintenance mode adds moisture to the dry winter air. The Geo Power System is a primary heat exchange ventilation system. Strikingly different from conventional systems, the Geo Power System exchanges heat with the ground, which is a free, unlimited source of natural energy. 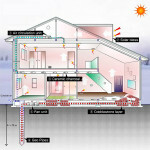 This gives the system outstanding energy efficiency. During the summertime the system fills the building with clean, refreshing air by naturally cooling, purifying, and dehumidifying the air. The energy-saving design includes a fan unit that uses a brushless DC motor, which reduces wasteful energy consumption. Ventilation times can be set on a timer. Air intake and exit points are located away from building occupants, ensuring safety. Air cycle times can be set on a timer. The continual air flow makes a refreshing indoor environment. The control panel is used to set operation timers and air flow speed and to check the system status. The cobblestone layer stores heat in the winter and coolness in the summer, thereby helping reduce energy use. 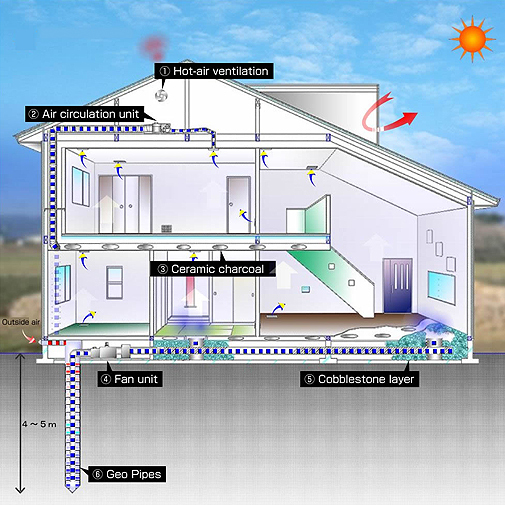 The Geo Pipes exchange heat with the ground, providing heating, cooling, humidity control, and air purification.